How To Install Patio Pavers - Tile Tech Inc.
Patios redefine the concept of personal space. Cozy indoor corners can also be recreated outside the home amidst lush landscaped gardens, or majestic cityscapes. Empty backyards and roofs can be transformed into a laid-back barbeque spot where family and friends can come together and have fun. Patios can be free standing to create an extra outdoor living space, or it can be attached to the house serving as an extension. The central feature of patios is the flooring. This serves as the base upon which furniture can be laid. Floorings also function as markers to define the patio area. Several types of materials such as stone, brick or concrete can be utilized as patio pavers to recreate any environment. A professional team has expertise on how to install patio pavers and they can do it for anyone. Yet, you don’t have to become a professional. Any person willing to learn can know how to install patio pavers. Read on to find out some basics on how to install patio pavers. Anyone learning how to install patio pavers has to understand the importance of the base. To translate a patio design concept into the living space, the first basic step is the preparation of the base. This procedure entails measuring the designated patio area to determine how much material is needed. Markers are put in place to serve as reference for laying the pavers. Once the area is marked, the next thing to do is to clear the area. For roof patios, this involves patching holes and scrubbing the roofs. For backyard patios, grass and other debris are removed in preparation for excavation. Base materials are the applied in the following order: 1) liners, 2) other base material (sand, gravel for backyard patios). Tamping compresses gravel and sand to create a stable base. The second basic step is the laying of pavers. Interlocked pavers, brick pavers are laid on a level surface and should be equally spaced depending on the chosen design. Ever wondered how to install patio pavers that are sturdy? The key is to ensure that there are minimal gaps to prevent misalignment or displacement of pavers. This is possible with the use of high quality liners and by filling small gaps with sufficient fine materials. Knowing how to install patio pavers is easy with the aid of several reference materials online and in magazines. 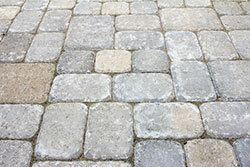 Through careful planning and preparation successful paver installation can be achieved.